looking for a fancy pair of shoes to start off the new year? 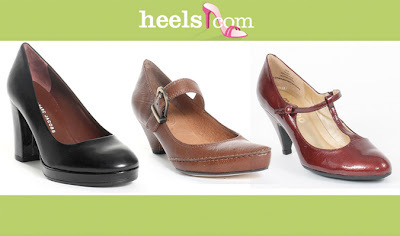 heels.com is a new site, packed with lots of fabulous shoes for women. being a true lover of shoes, I’m always browsing through shoes, and picking out favorites for next time I go on a shoe run. heels.com has a great sorting system, where you can find exactly what your looking for by filtering through styles, brands, heels, sizes, or color. my personal favorites? Corso Comos, the most comfortable shoes ever, and the great styles by Marc Jacobs. and just because I know everyone enjoys discounts, especially on shoes, from now until January 31, heels.com is offering a special discount to unruly-things readers. take 10% off your order at heels.com. at the checkout, simply redeem the coupon code, unruly10. with free overnight shipping to top it off, you could be prancing around in your new shoes before you know it.